CORRECTION: A previous version of this post mentioned the indigenous peoples’ march was not in rejection of carbon markets, however the press release issued by the group does have language rejecting carbon markets. This post reflects the correct information, and we apologize for the error. One of the more anticipated events at the U.N. climate conferences is the annual civil society protest-march held during the negotiations. This year’s in Cancún has already received a lot of attention because of the anticipated larger-than-normal participation by indigenous peoples and rural groups. There have been rumors for weeks now that this year’s march would be to protest policies for Reducing Emissions from Deforestation and Forest Degradation (REDD+). Respect the Human Rights of Indigenous Peoples contained in the U.N. Declaration on Human Rights for Indigenous Peoples (UNDRIP): UNDRIP is actually contained in the annex on safeguards for REDD+ implementation, so they already have this in place in a final agreement. Respect Their Right to Free, Prior, and Informed Consent (FPIC): Indigenous peoples want the right to say “no” to any REDD+ projects on their land. FPIC is contained in UNDRIP, so it is technically already in a potential final agreement on REDD+. However, indigenous peoples would like to see it explicitly included. Recognition and respect of indigenous peoples traditional knowledge and use of it as a solution for climate change: Indigenous peoples have been conserving the forest since the beginning, and they want some of their knowledge used and recognized. In a sense, they are saying “Work with us when you are designing REDD+ programs because we can make them better.” The potential REDD+ final agreement does already require “full and effective participation of relevant stakeholders, in particular, indigenous peoples and local communities” in REDD+ programs. Indigenous peoples, who contribute crucial expertise and traditional knowledge about the forests and are the best-suited to monitor and protect the trees, must play a central role in REDD+. 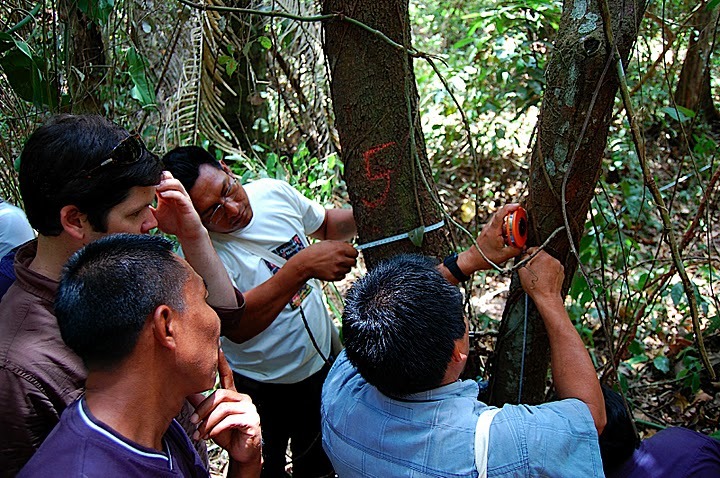 Above: an indigenous community learns how to estimate the amount of carbon is stored in the tree, which they will report for future REDD+ projects. The Coordinating Organization for the Indigenous Peoples of the Amazon Basin (COICA), an indigenous peoples group who EDF works with, recently spoke about their organization’s REDD policy. COICA is not for or against REDD+, but requests certain rights be recognized, such as right to land, resources and self-determination. Once these rights are ensured, COICA believes, indigenous peoples can make a decision for themselves whether to participate in REDD+ projects or not. EDF also believes these rights to land, resources and self-determination are the foundation for any REDD+ project or program to be successful. Back at today’s march, sure there were groups participating with an anti-REDD+ message – but they are not the majority. To place all indigenous peoples in the category of anti-REDD+ groups is a mistake, especially given the official statement from their caucus saying nothing of the sort. There are a number of indigenous groups within – and outside – the U.N. climate negotiations, and we’re encouraged to see the focus of the official indigenous peoples’ march is not against REDD+, but instead for recognition of their own rights. This is part of a series from EDF’s experts, who are blogging regularly from the U.N. climate conference in Cancún on EDF’s Climate Talks blog. This entry was posted in Cancún (COP-16), Indigenous peoples, News, REDD+, UN negotiations. Bookmark the permalink. Trackbacks are closed, but you can post a comment. También seguimos rechazando el mercado de carbono por ser una falsa solución al cambio climático. Nuestra Madre Tierra no es un objeto de comercialización. En particular insistimos que los bosques tienen una variedad de funciones y que son la fuente de vida para los pueblos indígenas del mundo, incluyendo los pueblos en aislamiento voluntario. Por eso no pueden ser parte de ningún programa o esquema basado en la compensación por mercado de carbono. Seems pretty unambiguous to me. Perhaps rather than expressing hope that some indigenous organisations might support EDF’s current position, it would be better to go out and talk to indigenous groups about why they are so concerned about the use of carbon markets and the current REDD proposals? I was at the march, and can testify that at least 1000 times I heard anti-REDD chants, and I saw at least 1000 anti-REDD tee-shirts, banners, signs, stickers and newespapers. I didn’t see or hear a single pro-REDD statement. This blog post is the most embarrassingly inaccurate propaganda I’ve seen from EDF in quite a while. DO try to improve your reporting, and cease the divide-and-rule pose, it doesn’t suit yet another a Washington institution (not so soon after the Maldives and Ethiopian leaders were just busted by Wikileaks for caving in to Stern’s gang). I note that you have adapted the piece since I, and perhaps others, noted that the Indigenous Caucus did categorically oppose the use of carbon markets. I would be interested in hearing your opinions on two very compelling reports on the fundamental problems of REDD – Friends of the Earth’s report on REDD: the realities in black and white (http://www.foei.org/en/resources/publications/pdfs/2010/redd-the-realities-in-black-and-white) – and No REDD: a reader (http://noredd.makenoise.org/). They both suggest that while using a price mechanism to reward forest protection might sound a sensible idea especially in the market-obsessed US; in practice it is leading to rewarding logging companies, absolving fossil-fuel companies of their need to reduce emissions, and undermining the rights and dispossessing communities who have lived for centuries in harmony with nature. Isn’t the obsession with market mechanism one of the driving causes of climate change rather than its solution? I look forward to seeing your response to nickb’s questions, above. Meanwhile, check out some photographs from the march, posted here. And this post on REDD-Monitor: “Environmental Defense Fund caught REDD-handed“. It includes an interesting video from Democracy Now! about the march – unlike you, they actually bothered to speak to some of the people on the march. I wonder how you arrived at the conclusion that the majority of people marching were not anti-REDD? Particularly when the march was organised by Via Campesina, which is opposed to both REDD and carbon markets. Thanks for your comments and questions. EDF and I have worked with Indigenous Peoples at their request for many years and at various levels, and look forward to continuing to help them secure their rights to self-determination, lands, and natural resources. @Chris: To clarify, as I mentioned in my post, the Indigenous Peoples groups joined the general civil society march outside the Conference of Parties to the UNFCCC; Via Campesina did not, as you say, organize it. What everyone (admittedly, myself included,) seems to be referring to as a single “march” is more accurately described as a number of blocs of indigenous peoples and non-indigenous groups who, alongside each other, demonstrated for a wide range of messages. For example, the International Forum on Globalization (IFG) coordinated a group marching for — among other issues — human rights. In the eight pictures from the march on the organization’s website (http://www.ifg.org/news.htm), not one includes an anti-REDD sign. To your other point, I actually did speak with numerous people who attended the march, and their reactions were quite different than those captured by Democracy Now!. Furthermore, various indigenous groups are developing REDD projects in their territories, and others express active interest –- further evidence of the wide range of opinions regarding REDD that Janet mentioned. @nickb: That’s an important point. We always make a serious effort to be sensitive to indigenous peoples’ concerns about REDD, and I encourage you to read my post about a recent workshop EDF helped coordinate in Ecuador (http://blogs.edf.org/climatetalks/2010/10/29/ecuadorian-indigenous-community-takes-forest-conservation-into-own-hands/) to see how communities are getting prepared and excited for REDD projects in their areas. EDF has supported, and will continue to support Indigenous Peoples’ rights, especially their right to make decisions for themselves based on information from every perspective. Chris, Please do not use IFG to justify EDF’s approach to REDD. True, the Mayan forest and farming community members who marched with our support did not have any signs saying anti-REDD slogans but neither did they have any “pro-REDD” signs. Personally, I find both of those frames confusing and unhelpful in our mobilizing public support for something we must do: diminish the nearly twenty percent of global emissions that come from deforestation. There’s no global climate solution without doing this, but how to do so in ways that protect the people who protect the forests? ‘More accurate’? It’s apparent from the above that EDF suffers from mistranslation (‘alongside’? ), or a blog misreading, or worse. There was a march of thousands organised by La Via Campasina that nearly got as far as the airport road before running into police opposition on Tuesday afternoon. The backsliding EDF reply, without coming to grips with even the basic facts of the matter much less the huge implications for solidarity and advocacy, is indicative of the need for a more genuine soul-searching. But given EDF’s dogmatic commitment to carbon markets and tradition of ignoring the critiques, none of the this interpretive fiasco is really a surprise, is it. What’s most worrying, is the systematic dishonesty deployed to further what is already a divide-and-conquer phenomenon as bad as any I’ve ever seen in climate politics. Shame, Chris!